The href=”http://www.apple.com/ipad/” rel=”homepage” target=”_blank” title=”iPad”>iPad 3 hasn’t even officially been announced yet it’s enjoying huge amounts of press attention owing to a series of high profile leaks which have given the world a potential glimpse of what could be on offer this March. To get an idea of just how competitive the iPad 3 could be we’ve decided to measure against a very reliable yardstick, the Samsung Galaxy Tab 10.1. So let’s see if the proposed spec of href=”http://www.apple.com/” rel=”homepage” target=”_blank” title=”Apple”>Apple’s next big thing can hold its own against Samsung’s very impressive Android-based device. Rumour has it that Apple will outfit the iPad 3 with a quad-core A6 chip, which will likely be clocked to around 1GHz. The device should have 1GB RAM too, giving it a real speed boost. Users can also expect the device to be shipped in 16, 32 and 64GB flavours, though we wouldn’t get our hopes up for any removable storage support. The Galaxy Tab 10.1 from Samsung runs on the dual-core 1GHz Cortex-A9 chip on offer in nVidia’s Tegra 2 T20 chipset, which also offers a ULP GeForce GPU. The device has 1GB RAM, comes in 16, 32 and 64GB models and, as we predict for the iPad 3, offers no support at all for removable memory. Samsung’s Galaxy Tab 10.1 features a very impressive 10.1-inch PLS TFT display with a resolution of 800×1280 pixels and offers up a pixel density of 149ppi. The display is responsive, offers decent viewing angles and can deal with the odd scratch and scrape too, thanks to a layer of Corning’s Gorilla Glass. Apple’s iPad 3 is rumoured to feature a 9.7-inch LED-backlit IPS TFT with a resolution of 2048×1536 pixels, twice that of the iPad 2. Analysts predict a pixel density of around 170ppi too, which will put the device’s display up there with the best of them in terms of sharpness. Users can expect a scratch proof coating on the device too, though we aren’t sure it will be Gorilla Glass 2 as some sources are reporting. Apple iPad 3 – ? Samsung’s tablet is a sleek device which is very comfortable to use, even for extended periods. The Galaxy Tab 10.1 is very thin at just 8.6mm. The Galaxy Tab 10.1 is crafted mainly of plastics, giving it a light feel and the device’s aesthetic is minimalist and symmetrical. While Apple’s iPad 3 is rumoured to be a wee bit thicker than the 8.6mm of its predecessor, this is apparently to allow for a larger battery. Rumours have been circulating that the device may well offer a curved glass display too, though we aren’t sure how that will fit in with Apple’s design template. Users can expect the device to be constructed of plastics and metal, and we would be very surprised if it didn’t share the same premium feel exuded by its forebears. Apple’s iPad 3 will run on the next iteration of href=”http://www.apple.com/ios” rel=”homepage” target=”_blank” title=”IOS”>iOS, which has won plenty of admirers for its unfussy, easy to use qualities. The device will benefit from the 400,00+ apps on offer in the href=”http://www.apple.com/itunes” rel=”homepage” target=”_blank” title=”App Store (iOS)”>Apple App Store and will enjoy support for plenty of tablet-specific apps too, something which Google’s Android platform is struggling to keep up with. iOS isn’t as open as Google’s OS though, and you can expect to be forced to use iTunes to manage your media, which is a big downside to some users, not least of which those that use Linux based platforms on their home systems. There are plenty of third-party apps available for Android, many of which are excellent and 100% free! The downside, as we mentioned, is that Android powered tablets lack specific applications, though Google are doing what they can to rectify this. Unlike iOS Android can be customised, and Samsung’s TouchWiz 4.0 overlay adds a nice visual touch to the platform. The UI also adds social networking integration and support for other functionality, such as gaming and reading, that is also present in Apple’s software. We look forward to seeing a vastly improved camera in the Apple iPad 3, and some parties are predicting that the tablet will see the same superb 8-megapixel primary camera as that of the href=”http://www.apple.com/iphone” rel=”homepage” target=”_blank” title=”IPhone 4S”>iPhone 4S. Expect an LED flash, autofocus, geo-tagging and 1080P video capture, as well as an upgraded secondary snapper for high definition FaceTime use. Samsung’s Galaxy Tab 10.1 doesn’t offer much in the way of photographic prowess, with a fairly measly 3.15-megapixel primary camera (with LED flash, autofocus, geo-tagging and 720P video capture) which, in ideal light, takes a decent picture, but struggles with noise and shutter lag. The device’s secondary 2-megapixel camera is much more pleasing though, and the device is able to offer high quality video calling as a result. 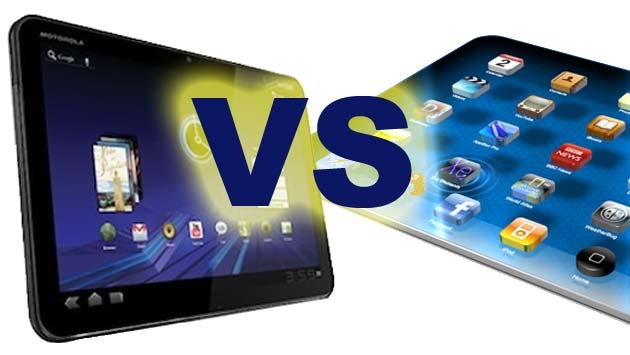 Apple’s iPad 3, with its speculated/leaked specs, has trounced Samsung’s Galaxy Tab 10.1 in our comparison today and if the finished article is in-line with our predictions it will easily compete for the crown of top tablet. It will face stiffer competition that the Galaxy Tab 10.1 though, such as Asus’ Eee Pad Transformer Prime, but we’re confident that Apple has the cards up its sleeve to keep a hold over the market for another year.